Looks like Best Buy Canada is going to create quite a stir at its stores when Batman: Arkham Asylum releases on August 25th. On their twitter page, they recently announces a 3 day mind boggling price of $38.83. 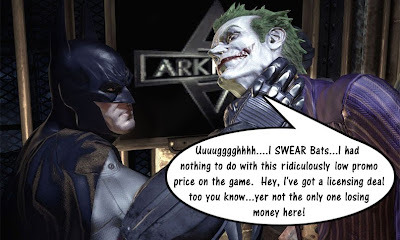 Yes, you read that correctly...get Batman: Arkham Asylum for only $38.83. This price will stand for both the Xbox 360 and PS3 versions from August 25th to 27th. Not to be outdone, Walmart Canada is also advertising the game for $38.83 for both the Xbox 360 and PS3 versions. Although Wal-Mart's advertisement doesn't seem to have a time duration for the price. At this price, there should be virtually no reason why gamers in Canada don't pick up this game. If you need more convincing, then you can check out my impressions of the demo. Are you kidding me? I have to check this out. Holy crap Batman! If the rest of the game is as good as that demo, a for sure buy and at an unbeatable price. The Regular price is 70 $CAN. And for correction, Walmart announced it first for 38$, and Best Buy was forced to follow (price matching would mean selling it for less than 35$!). WyldRage is right about Walmart announcing the debut $38 price point. I think they were also Great price for a promising looking game. I really wasn't planning on buying this for $70 but now I'd just feel stupid for passing it up. Looks like Walmart has all but given up being the cheapest price. Now they only match other retailers. Walmart is getting worse and worse. the guy above obviously didn't read the posts...Walmart had this price first...it was announced on Xbox Live and on walmart.ca take a look for yourself, it is printed in this weeks flyer too...I bet when we see the best buy flyer it will be in there a $69.99 hahaha BB got owned by walmart.